View from the high rock wall, looking down. Aerial cutaway view from outside the Coastal Fog Desert, Mangrove Forest, Upper Savanna, and Ocean biomes, looking in. Booklet design by Ken Godat. 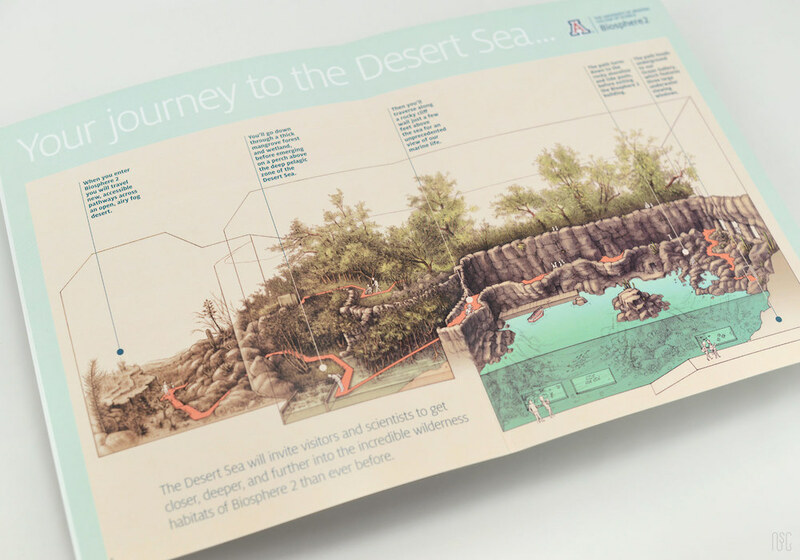 Director of the Biosphere2 Ocean, Dr. Rafe Sagarin, asked me to illustrate a visual portfolio for the proposed construction of the Desert Sea biome. These images are being used to raise funds to transform the 676,000-gallon saltwater tank into a living model of the Gulf of California. "The Desert Sea will look like the Gulf– where the desert and the sea connect– with cactus-studded islands, rocky shorelines and tide pools, and a rich sargassum forest in its 21-foot deep open water zone. These habitats will become home to a diverse range of the amazing living creatures of the Gulf. Taken together, the Desert Sea will be a whole new way of studying, teaching, and sharing marine science with people who may live far from the sea."